Experience the Passion & Expertise of Freedom. Providing Surf Education programs to the highest standard. 35 years of surfing experience. Freedom utilise Tramore's 5km Blue Flag Surf Beach,Four Eco Systems and its Amazing Coastline to provide a unique range of Coastal Activities. Fun, Adventure & Learning at Freedom.Primary & Secondary School Tours, Cert Courses, Overnight Stays and Irish Language Surf & Adventure Programmes. Freedom Surf School is all about making your experience unique, by providing personal attention, skills and knowledge to the teaching of surfing within a safe & fun environment. 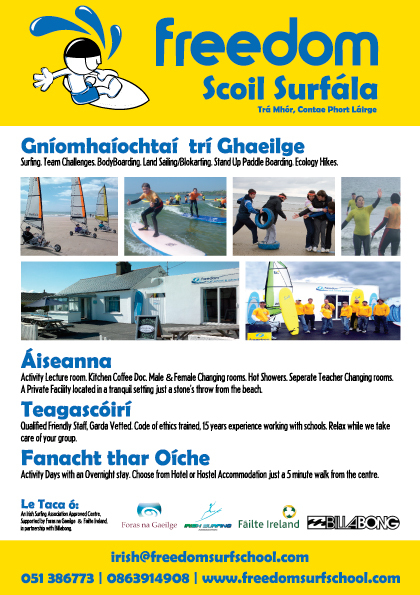 Safety, customer service, qualified staff & the promotion of physical activity for life are core values of Freedom Surf School.Utilising Tramore's Unique Coastal environment we provide a range of Outdoor Education Programmes and Activities that are both challenging and fun. Grade A surf school facilities include Indoor Activity Lecture Rooms, Male & Female Changing Rooms. Hot Showers .Coffee Bar with indoor /outdoor seating areas. Located on the Lane just a stone’s throw from the beach. surrounded by Cottages this private facility provides an atmosphere of peace and tranquility for you and your group.